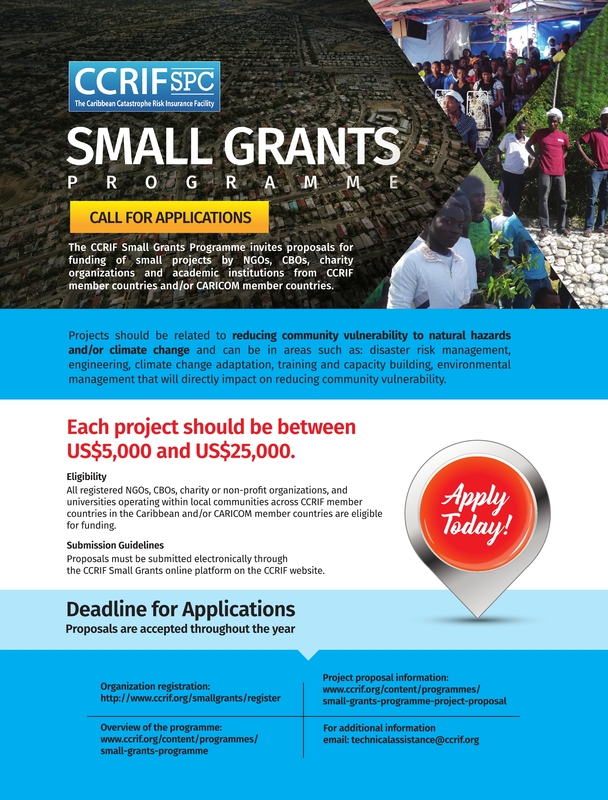 Through its Technical Assistance Programme, CCRIF provides a maximum of four scholarships annually for students pursuing a Masters or an MBA programme in a number of pre-identified areas related to disaster risk management (see eligibility criteria) which are available at universities in the United Kingdom, United States and Canada and at eligible universities in the Caribbean, other than the University of the West Indies (UWI). CCRIF provides scholarships for study at UWI through the CCRIF-UWI Scholarship Programme, which is administered by UWI. Scholarship recipients must be citizens of CARICOM member countries and/or CCRIF Caribbean member countries. Eligible programmes also include an MBA with a Major in risk management and/or insurance or a related field. Online programmes available through eligible regional universities or at universities in the United Kingdom/ United States/Canada are also eligible for these scholarships. Eligible online programmes include two-year part-time programmes. Applicants must be holders of a First Class or Upper Second Class Honours bachelor’s degree (or have a GPA of at least 3.0) in an area related to disaster risk management, environmental management, geography/geology, engineering, actuarial science or a related discipline. Preference may be given to candidates who have some work or volunteer experience in a related field. The scholarships are valued at a maximum of US$40,000 each (for universities outside of the region) or up to US$20,000 (for regional universities) and are specifically for those applicants who have gained admission to a Masters level programme or an MBA programme fitting the eligibility criteria presented above. persons with supporting nominations from publically-funded (government) national or regional agencies whose mandates are specific to risk management, disaster management, meteorology, climate change, engineering or environmental management. In the event that the CCRIF scholarship does not cover the total cost of attendance for a specified programme of study, the candidate will be required to demonstrate the availability of support funding to cover the entirety of the programme being considered. Recipients must be registered full-time (except in the case of online programmes). Recipients will be bonded to work in the Caribbean for a period of three years immediately after graduation. Scholarships will not be awarded until a bonding agreement has been established and signed between the nominated scholarship recipient and the government of the respective country or other authorized institution and until all visa requirements have been met. Recipients will be required to abide by a CCRIF Scholarship Code of Conduct that governs their interaction with CCRIF SPC and the University. Recipients will be required to sign an agreement with CCRIF agreeing to the terms and conditions of the scholarship prior to the commencement of their programme. Recipients who withdraw from the programme without good reason and the approval of the Academic Director, or who fail to complete the programme, will be required to repay the award. Recipients are expected to achieve academic excellence and are required to ensure that grades are at least a Merit or B grade. A report on academic performance will be required at select times within the academic programme. Upon completion of the programme, recipients will be required to notify CCRIF SPC of their employment in the Caribbean at select times/intervals within the bonding period and as stipulated in the signed agreement. Recipients who fail to complete the bonding period will be required to repay the award. * Denotes a mandatory field - your submission will not be accepted until all such fields are complete. Names of the uploaded documents must match their contents.